Background Anesthetic management of a pediatric patient with pulmonary arterial hypertension (PAH) poses an enormous challenge. The objective of this study was to evaluate the ability of dexmedetomidine to reduce the pulmonary artery pressure in pediatric patients with PAH undergoing cardiac surgery. Patients and method Seventy patients diagnosed with PAH were enrolled in this study. The patients were randomized into two groups: group D received dexmedetomidine infusion of 1 μg/kg/h for one hour, which was reduced to 0.5 μg/kg/h throughout the surgery until extubation in the post anesthesia care unit (PACU), and group C received 0.9% normal saline in the same volume. Pulmonary artery systolic pressure (PASP) and systemic systolic blood pressure (SSBP) were recorded throughout surgery and postoperatively in the PACU. The need for vasodilator and sedative drugs and the time of extubation and ICU stay were recorded for all patients. Results The patients in the dexmedetomidine group showed a significant decrease in PASP and PASP/SSBP ratio during surgery and throughout the first 24 h in the PACU (P<0.001). The dexmedetomidine group required a significantly lower amount of vasodilator drugs than the control group (P<0.001), as well as a lower amount of sedatives (P<0.001). Conclusion We concluded that perioperative use of dexmedetomidine in pediatric patients with pulmonary hypertension reduces the PASP throughout the operative and postoperative period. Anesthetic management of a pediatric patient with pulmonary arterial hypertension (PAH) poses an enormous challenge. The main triggers of increasing pulmonary pressure that can be avoided perioperatively include hypoxemia, hypercapnia, pain, hyperthermia, and hypovolemia. All these factors contribute to the increase in pulmonary pressure through sympathetic stress response, which increases the pulmonary vascular resistance (PVR) ,,. Dexmedetomidine is a specific and selective α2 adrenergic agonist with rapid tissue distribution and a short half-life . Dexmedetomidine has been proved to reduce the hyperdynamic responses (increased blood pressure and heart rate) and attenuate the cardiovascular response to surgery in pediatric patients during cardiac surgery ,. However, only limited information exists regarding the effect of dexmedetomidine on the pulmonary vasculature and PVR ,,. The objective of this study was to evaluate the ability of dexmedetomidine to reduce pulmonary artery pressure (PAP) in pediatric patients with PAH who are undergoing cardiac surgery. This study was performed in the Cardiothoracic Surgery Unit, Ain Shams University Hospitals. After obtaining approval from the local institutional ethical committee and signing of an informed consent form by the parents, 70 consecutive pediatric patients (age: 1–18 months and weight: >2 kg) with PAH undergoing elective cardiac surgery with cardiopulmonary bypass (CPB) were included. The patients were diagnosed with pulmonary hypertension (PH) before surgery with transthoracic echocardiography (HP Sonos 5500; Hewlett-Packard, California, USA). Pulmonary artery systolic pressure (PASP) was estimated using the modified Bernoulli (4×velocity2) through the tricuspid regurgitant peak velocity plus central venous pressure. Given the variability in systemic artery pressure that exists among different age groups, we also calculated the ratio of PASP to systemic systolic blood pressure (SSBP). PH is defined as PASP more than 35 mmHg and PASP/SSBP more than 35%. The patients enrolled into the study were randomly assigned to two groups using a computer-generated random sequence of numbers: the dexmedetomidine group (group D) (n=35) and the control group (group C) (n=35). The study drugs were prepared by an independent anesthesiologist; therefore, all anesthesia personnel were blinded to the treatment received by the patients; moreover, to ensure consistency in the surgical, anesthetic, and postoperative approach during the study period, the medical team remained the same, including the cardiothoracic surgeons, cardiac anesthesiologist, and cardiac intensivists. Anesthesia was induced with midazolam 0.05 mg/kg, fentanyl 5 μg/kg, and rocuronium 0.2 mg/kg. Noninvasive blood pressure was measured every 2 min until an artery was cannulated for invasive blood pressure monitoring. After tracheal intubation, infusion of the study drugs was instituted. Group D received infusion of dexmedetomidine (Hospira Inc., Lake Forest, Illinois, USA) 1 μg/kg/h for 1 h, after which it was reduced to 0.5 μg/kg/h throughout surgery until extubation in the post anesthesia care unit (PACU). In group C, 0.9% saline was infused for the same period of time and the same volume as for group D.
The patients were maintained on isoflurane (end-tidal 0.5–1.6%) and fentanyl infusion 2 μg/kg/h and rocuronium 0.1 mg/kg/h. During the CPB, the flow was 2.5–3 l/min, hematocrit was maintained between 25 and 30%, and sodium nitroprusside 1.6 μg/kg/min was administered to maintain a mean arterial pressure between 30 and 70 mmHg. For inotropic support, epinephrine (0.02–0.1 μg/kg/min) and milrinone (0.5–1.2 μg/kg/min) were used to facilitate weaning from CPB. After sternotomy and direct exposure of the pulmonary artery, the PASP was monitored by a direct arterial catheter inserted by the surgeon into the main pulmonary artery trunk, and the ratio between PASP and SSBP was also calculated and recorded immediately after sternotomy, after aortic clamp removal, and 10 min after initiation of protamine infusion. In the PACU, the patient continued to receive the study drugs until extubation. The quality of sedation was assessed every 1 h using the Ramsay scale . A Ramsay scale between 3 and 5 was achieved for all patients with intermittent administration of morphine 0.05 mg/kg and midazolam 0.3 mg/kg every hour as needed. On arrival at the PACU, further assessment of PASP/SSBP was done by transesophageal echo, and then every 12 h until the first 24 h after CPB. The duration of mechanical ventilation and length of stay in the ICU as well as the requirement for inotropic and vasotropic support during the first 24 h study period were recorded for all patients. The primary outcome of the study was the effect of dexmedetomidine on PASP and the PASP/SSBP ratio in patients with PH undergoing cardiac surgery. The secondary outcome was the effect of dexmedetomidine on the requirements of inotropic and vasotropic support and duration of mechanical ventilation and ICU stay for these patients. The sample size calculation was based on the primary endpoint of the study, which is the ratio between PASP and SSBP. A group sample size of 30 is suggested in both groups to achieve 80% power, to detect a difference between the group proportions of 0.35 in the ratio between the PASP and SSBP. The test statistic used is the two-sided Z-test with pooled variance. The significance level of the test was targeted at 0.0500. The significance level actually achieved by this design is 0.0491. Seventy patients were enrolled into the study, with 35 patients in each group. Five patients were excluded from the study: two in each group because of excess time (>50 min) taken to insert the central venous presure (CVP) and the arterial cannula and one in the dexmedetomidine group because the surgery planned with CPB was changed to systemic pulmonary shunt with CPB. [Table 1] shows no significant differences between baseline demographic and clinical characters and surgical data. Estimated PASP and PASP/SSBP ratio were statistically lower in the dexmedetomidine group despite surgery, compared with the control group (P<0.001). Furthermore, the percentage decrease in PASP was significantly more than the decrease in SSBP. 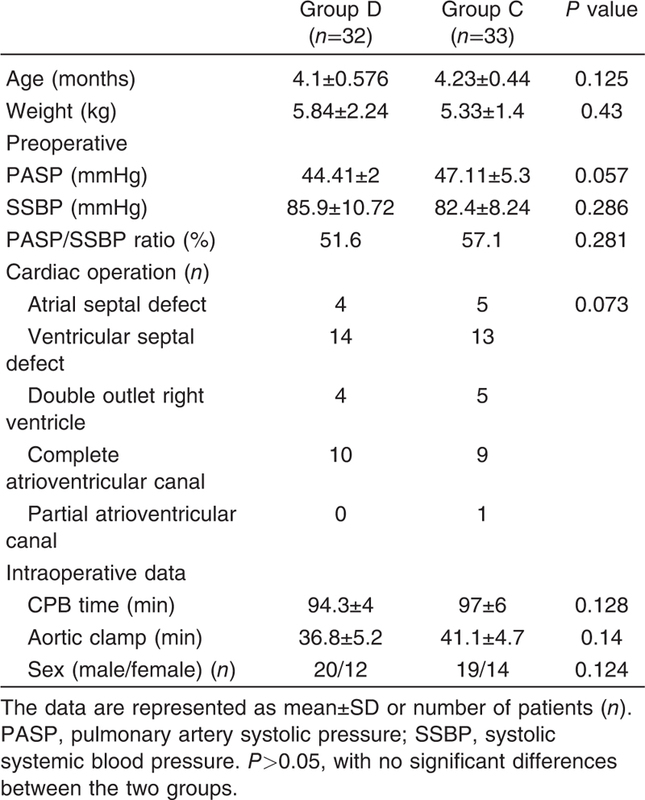 Although slightly lower SSBP was recorded in the dexmedetomidine group, these remained statistically unchanged throughout the intraoperative period (P>0.001) ([Table 2]). This decrease in absolute PASP and PASP/SSBP ratio in the dexmedetomidine group continued postoperatively throughout the study period (24 h after CBP) compared with the control group (P<0.001) ([Table 3]). As regards inotropics and vasotropics, patients in the dexmedetomidine group needed significantly lower dose of milrinone and no nitroprusside during the first 24 h (0.5±0.1 vs. 1.8±0.7 μg/kg/min, and 0.31±0.3 vs. 0.9±0.4 μg/kg/min), but with no significant difference in epinephrine requirement in the two groups (0.05±0.02 vs. 0.06±0.02 μg/kg/min) ([Table 4]). A significantly lower dose of sedative and analgesic drugs was used in the dexmedetomidine group to achieve a Ramsay score between 3 and 5 (0.59±0.87 vs. 2.78±2.13 mg/kg, and 0.59±0.79 vs. 3.5±2.1 mg/kg). The length of stay in the ICU and hospital stay was similar in both groups. Although patients in the dexmedetomidine group spent less time on the mechanical ventilator, this is of no statistical significance ([Table 5]). Dexmedetomidine is an α2 adrenergic receptor and imidazoline receptor agonist with sedative and analgesic properties. Its use in the pediatric population has been steadily growing over the last several years ,,,,,. Despite this growing interest, there is limited information on its effect on the PAP, which is of special importance in pediatric patients with congenital cardiac disease where an increase in PAP can lead to major hemodynamic instability in the perioperative period. In the present study, we evaluated the effects of dexmedetomidine on pediatric patients with PH undergoing surgical cardiac correction with CPB. Our findings suggest that dexmedetomidine is associated with a significant decrease in PASP as well as a lower PASP/SSBP ratio throughout the study. The ratio was calculated to allow a more accurate interpretation of the changes as systemic blood pressure variability may influence the PAP. The decrease in PASP and PASP/SSBP ratio found in our study is in agreement with the study by Snapir et al. on healthy volunteers and showed that PASP decreased by 70% and SSBP decreased by 15% after administration of a low dose of dexmedetomidine (0.5 μg/ml). More recently, Chrysostomou et al. investigated the perioperative efficiency of dexmedetomidine to decrease the incidence of arrhythmias and found that dexmedetomidine attenuates the hypercholinergic state after CPB and patients required fewer antiarrhythmic agents through the perioperative period. Dexmedetomidine in a dose (>2 μg/ml) higher than the recommended therapeutic concentration may generate a dose-dependent increase in PVR and progressive increase in PAP and decrease in cardiac output ,. In this study, a lower dose of dexmedetomidine is used; thus, none of the patients included in this study had elevated PASP after administration of dexmedetomidine. The effect of dexmedetomidine on PAP was estimated indirectly by reducing or eliminating the need for perioperative inotropic and vasodilator agents. The dexmedetomidine group required lower doses of milrinone and sodium nitroprusside in this study throughout 24 h postoperatively. In his study, Lazol et al. investigated the effect of postoperative administration of dexmedetomidine in the cardiac ICU and he suggested that the decrease in postoperative PASP was due to sedative and analgesic effects and possible activation of α2 adrenergic receptors that led to sympatholysis. The lack of sedation postoperatively increases coughing, hypoxemia, and hypercarbia, causing a rise in PAP. Therefore, all children in our study were sedated to a Ramsay score between 3 and 5. The dexmedetomidine group required significantly lower doses of sedatives and analgesic drugs throughout their ICU stay, which is consistent with the mechanism of action of dexmedetomidine to induce sedation, analgesia, and an anxiolytic state without respiratory depression ,,,. Although a lower dose of narcotics and analgesic drugs was required in the dexmedetomidine group, there was no significant difference in the duration of mechanical ventilation and length of ICU stay between the two groups. There is some limitation that needs to be taken into consideration for this study. We did not measure the cardiac output, and thus we may have missed a potential cardiac output effect that may alter the PASP and SSBP reading. Dexmedetomidine may decrease the catecholamine state enough to decrease the vascular resistance and thus decrease the blood pressure and improve the cardiac output. On the other hand, the decrease in milrinone dose after dexmedetomidine may decrease the cardiac output. However, our findings do not support a major change in cardiac output as there are unchanged inotropic requirements for epinephrine in both groups. Another limitation is that postoperatively PASP was assessed by echocardiography, and, although it is a well-established and accepted method, it may not be as accurate when compared with direct pulmonary artery cannulation data. In this study, we conclude that the perioperative use of dexmedetomidine for pediatric patients with PH reduces the PASP throughout the operative and postoperative period. Fischer LG, Van Aken H, Burkle H. Management of pulmonary hypertension: physiological and pharmacological considerations for anesthesiologists. Anesth Analg 2003; 96:1603–1616. Freire AX, Afessa B, Cawley O, Phelps S, Bridges L. Characteristics associated with analgesia ordering in the intensive care unit and relations with outcome. Crit Care Med 2002; 30:2468–2472. Friesen RH, Williams GD. Anesthetic management of children with pulmonary arterial hypertension. Paediatr Anaesth 2008; 18:208–216. Dyck JB, Shafer SL. Dexmedetomidine pharmacokinetics and pharmacodynamics. Anesth Pharm Rev 1993; 1:238–245. Klamt JG, Vincente WV, Giarcia LV, Ferreira CA. Hemodynamic effects of the combination of dexmedetomidine-fentanyl versus midazolam-fentanyl in children undergoing cardiac surgery with cardiopulmonary bypass. Rev Bras Anestesiol 2010; 60:350–362. Shukry M, Kennedy K. Dexmedetomidine as a total intravenous anesthetic in infants. Paediatr Anaesth 2007; 17:581–583. Lazol JP, Lichtenstein SE, Jooste EH, Shiderly D, Kudchadker NA, Tatum GH et al. Effect of dexmedetomidine on pulmonary artery pressure after cardiac surgery: a pilot study. Pediatr Crit Care Med 2010; 11:589–593. Su F, Nicolson SC, Gastonguay MR, Barrett JS, Adamson PC, Kang DS et al. Population pharmacokinetics of dexmedetomidine in infants following open heart surgery. Anesth Analg 2010; 110:1383–1392. Tobias JD, Berkenbosch JW. Sedation during mechanical ventilation in infants and children: dexmedetomidine versus midazolam. South Med J 2004; 97:451–455. Berkenbosch JW, Wankum PC, Tobias JD. Prospective evaluation of dexmedetomidine for noninvasive procedural sedation in children. Pediatr Crit Care Med 2005; 6:435–439; quiz 440. Chrysostomous C, Sanchez De, Toledo J, Aviolo T, Motoa MV, Berry D et al. Dexmedetomidine use in a pediatric cardiac intensive care unit: can we use it in infants after cardiac surgery? Pediatr Crit Care Med 2009; 10:654–660. Tobias JD. Dexmedetomidine to treat opioid withdrawal in infants following prolonged sedation in the pediatric ICU. J Opioid Manag 2006; 2:201–205. Chrysostomou C, De-Toledo JS, Wearden P, Jooste EH, Lichtenstein SE, Callahan PM et al. Perioperative use of dexmedetomidine is associated with decreased incidence of ventricular and supraventricular tachyarrhythmias after congenital cardiac operations. Ann Thorac Surg 2011; 92:964–972. Nathan AT, Marino BS, Hanna B, Nicolson SC. Novel use of dexmedetomidine in a patient with pulmonary hypertension. Paediatr Anaesth 2008; 18:782–784. Snapir A, Posti J, Kentala E, Koskenvuo J, Sundell J, Tuunanen H et al. Effects of low and high plasma concentrations of dexmedetomidine on myocardial perfusion and cardiac function in healthy male subjects. Anesthesiology 2006; 105:902–910. Elbert TJ, Hall JE, Barney JA, Uhrich TD, Colinco MD. The effects of increasing plasma concentrations of dexmedetomidine in humans. Anesthesiology 2000; 93:382–394. Hosokawa K, Shime N, Kato Y, Taniguchi A, Maeda Y, Miyazaki T et al. Dexmedetomidine sedation in children after cardiac surgery. Pediatr Crit Care Med 2010; 11:39–43. Tokuhira N, Atagi K, Shimaoka H, Ujiro A, Otsuka Y, Ramsay M. Dexmedetomidine sedation for pediatric post-Fontan procedure patients. Pediatr Crit Care Med 2009; 10:207–212. Tobias JD, Gupta P, Naguib A, Yates AR. Dexmedetomidine: applications for the pediatric patient with congenital heart disease. Pediatr Cardiol 2011; 32:1075–1087. Gupta P, Whiteside W, Sabati A, Tesoro TM, Gossett JM, Tobias JD et al. Safety and efficacy of prolonged dexmedetomidine use in critically ill children with heart disease. Pediatr Crit Care Med 2012; 13:660–666.